A high quality gas cylinder lift system makes sure you are positioned optimally at your desk, whether it's for work or for racing a few laps! Furthermore, the chair is upholstered with the highest quality black Alcantara, a suede like material that gets used for the seats in real racing cars! The chair is very stable with an extra sturdy foot and has an adjustable backrest which provides ultimate flexibility. Playseat® Office Chair - Alcantara: the great looking sports chair that can be used for work and gaming! High quality black Alcantara upholstery, the material that gets used in real racing cars! Good looking chair with alcantara fabric and heavy polished steel leg, that looking like Ferrari rims. 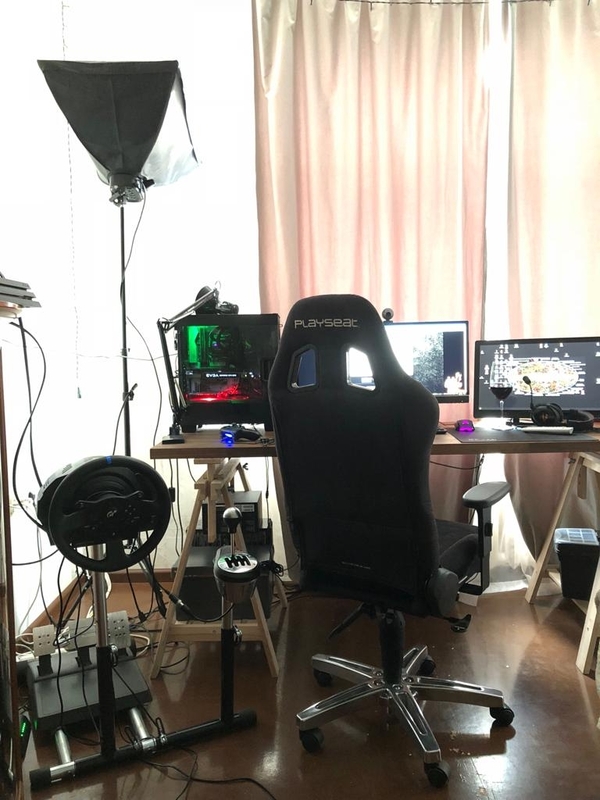 I use this chair with wheel stand pro + Thrustmaster T300 wheel +TH8A. This chair also very comfortable for long time work with my IKEA table. This has to be the coolest looking office chair! Unlike most other "sport seat" gaming chairs, this one is made of Alcantara which is always a premium option in higher end performance cars. A little like the lovely Porsche GT3 or AMG Performance seats. The chair is well built and is a quality chair. Love the 5 Spoke + lugnut chair base design as well which is made of aluminium. We bought a couple of these for the office, and suddenly the office feels more fun with these "racing seats" facing our workstations. My only feedback is that yes, it's a little narrow, and may be a comfort issue for larger folks. It is a good and comfortable chair even for long duration's. Made from durable materials and well put together. My only real problem is that the springs in the back rest creek a lot when I lean back. Het is een goede comfortabele stoel ook als er voor lange tijd in gezeten wordt. Gemaakt van duurzaam materiaal en stevig inelkaar gezet. Mijn enige probleem is dat de veren in de rugleuning kraken als ik terug leun. The Playseat Office chair Alcantara is a really good chair, and the cool thing is that its made of alcantara. Its really nice and the design is so cool and nice, unlike other gaming chairs manufacturers which, have been too quick in the process of designing it. As an IT Pro and an avid gamer I was looking for a chair that would work for both purposes. This chair exceeded in every aspect of what I was looking for! The build / material quality, comfort, and the design of this chair is truly phenomenal! However, I hardly get to spend time in my new chair because I am not the only one in the house who thinks so! My cat thinks it's the best chair he's ever slept on. He also thinks the material was made just for him "Al-cat-tara". My cat loves the feel of it and I can't blame him, so do I. On that note, I would highly recommend this chair to anyone and I my self would buy again. Which I may have to sooner then later due to my cat! The seat, in general, is not very bad. The materials used are of good quality and solid. Unfortunately there are substantial flaws in design. First of all the armchair arm rests lack of proper docking and have tendency to slide out and fall on the floor unless tightening them every 5 minutes. It's really annoying and I've not found any solution for it until now. Second, even immediately after fixing these armrests they are unstable and shaky. Third, the wheels of chair don't have any option to lock and if you would like to use the chair not only for office use, but also for a racing with a wheel and pedals the seat slides back during gaming until you can't reach the pedals. That happens on all hard-floors and the only solution is to put the chair on a thick carpet. When we had to refurnish the office we were able to try one of the office chairs by Playseat®. We liked them so much that everyone in our office has one now, although it’s not permitted to play games during work hours… The chair is slightly heavier than other office chairs and is really strong. Only downside, according to me, is the arm rests. They are fine but considering the quality of the chair they could have been a little more stable. However, the Alcantara fabric is amazing! This chair is a perfect mix between professionalism and sportsmanship. I work in a showroom, so my desk is visible for every customer. Using the Office Seat with alcantara cover finishes my showroom. It looks profesional and sporty at the same time and is adjustable to suit your own preferences. I coincidentally found this office seat when I was looking for a new chair and although it’s quite expensive, I couldn’t find another chair that looks as good as this one. The alcantara feels great, but more important: the back of this office seat is sturdy and supports my back in such a way I can sit for hours in the chair without getting a sore back. It’s very adjustable and it looks awesome, so I think this is a great and quite unique office chair.